As I focus on becoming more efficient about the items I pack for my trip, I have started to revisit what I’m using to pack things in. My toiletry bag was a relatively large unorganized bag and I decided that I should try to find something that is a better match for my needs. 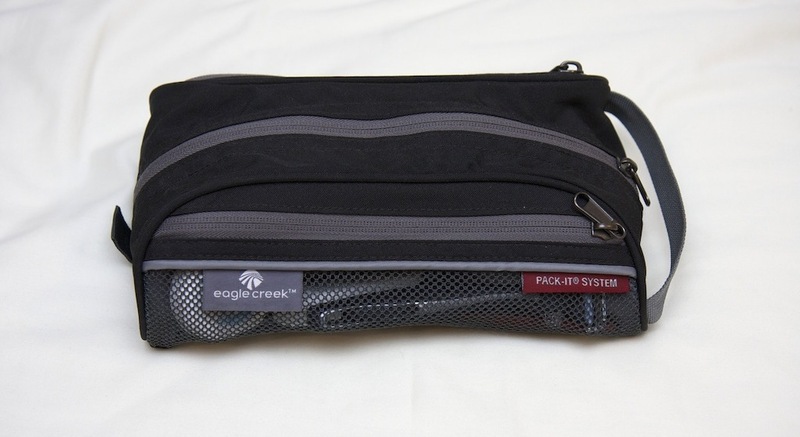 The Eagle Creek Pack-It Quick Trip toiletry bag looked to be a good match for my needs. The Quick Trip is smaller than my old toiletry bag and it has two side pockets as well as a large center compartment. Since I only take a single carry-on bag when I travel, and these days I’m using a Tom Bihn Tri-Star bag which means I’m carrying it on my shoulders or in my hand, the weight of my travel accessories is important to me. As I’ve begun to use it, I find that the Quick Trip is lightweight and compressible but still has enough structure to hold its shape on the countertop. Everything here is permanently kept in my travel bag. While I could use these items for both home and travel, keeping a separate set allows me a few less things to think about when packing. 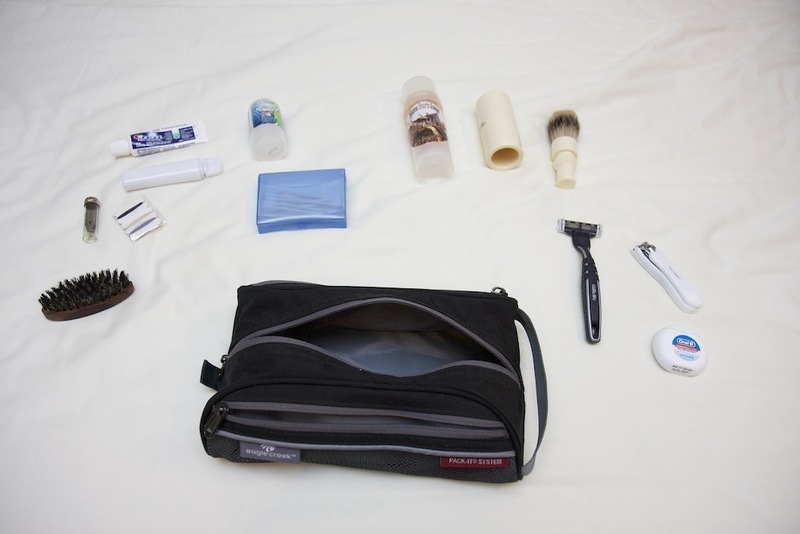 I don’t carry any liquids with me when I travel aside from the toothpaste, eliminating the need for a 3-1-1 bag. Technically I’m supposed to put the toothpaste in a 3-1-1 bag, but I’ve done at least 20-30 trips both domestically and internationally with the toothpaste inside my carry-on bag and never triggered a bag check. If I did have to give up the toothpaste, it is easy enough to replace when traveling. I can get another from the airline, if traveling internationally, or the hotel when I arrive at my destination. All of my toiletries pack well into the Quick Trip with room to spare. I keep the smaller items in one of the outside pockets, the razor (and on longer trips a second backup razor) in the other outside pocket, and the remaining items all in the center compartment. The elongated shape works well in my Tom Bihn Tri-Star travel bag. While I would prefer if the Quick Trip was a little smaller, it compresses down to not take extra room. Overall I’m quite happy with the Eagle Creek Pack-It Quick Trip and would recommend it to others with similar needs. Eagle Creek also makes a Specter version of the Quick Trip, which uses an ultalightweight fabric and weighs 1 ounce compared to 3 ounces for the regular version. I haven’t seen the Specter version in person, so I can’t comment on if the there is any downside to the lighter version besides a slightly higher cost.